Update: We are deeply saddened to report that Angela passed away on June 26, 2017. It is a privilege to continue to share her story and help keep her memory alive. 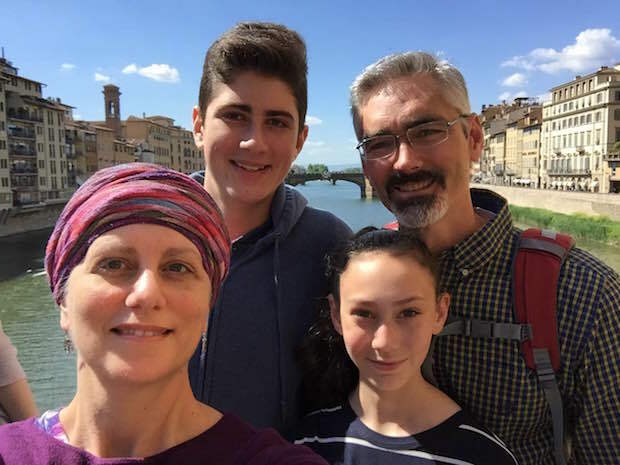 Angela was diagnosed with de novo stage IV triple-negative breast cancer in September 2015. Before her diagnosis, she worked as a director of research and evaluation at a national organization that supports young inventors and entrepreneurs and advances technology commercialization. She lives with her husband, son, and daughter in western Massachusetts. We asked her how she navigated enrolling in her first clinical trial, which began in May 2016. How were you first diagnosed? In July of 2015, I noticed a small area of dense tissue near my right armpit. It was so small the doctor couldn’t even feel it. She thought it was just a muscle, and said it was nothing to worry about, which was a relief because our family vacation was planned for the next day. After my routine mammogram the following month, I was called back for follow up because they saw an area of concern in the same spot I had identified. It was about a one-centimeter mass and one or two lymph nodes were involved. I got a biopsy that same day and received the results and cancer diagnosis a few days later. The pathology report said the tumor was negative for estrogen, progesterone, and HER2 receptors (making it “triple-negative” breast cancer), and a grade 3 (meaning it was faster-growing). This meant that chemotherapy was the only standard treatment option, and that it was going to be harder to treat than other types of breast cancer. I next had a series of scans to determine whether the cancer had spread beyond the lymph nodes. While that was very unlikely, since the tumor was so small, an abdominal MRI showed a small spot on my liver, and a biopsy showed the cancer had already spread, so it was already “de novo” stage IV. My husband and I were completely shocked by the news. I had no idea cancer could spread so quickly. I was only 46. I have no family history of breast cancer and have no genetic markers that would predispose me to it. I had a healthy, mostly plant-based diet for a long time. All of my prior mammograms since age 40 had come back clear. I’d never missed one, and I’d even elected to have the special “3D” mammogram a few years ago, which is supposed to be more sensitive. While previous reports stated I had dense breast tissue, I didn’t know that this meant I was at higher risk. Right after getting the liver biopsy results, I sought a second opinion to explore treatment options. A breast oncologist at a well-known cancer research center strongly recommended getting “standard of care” treatment at home (Taxol first, probably followed by carboplatin). She explained that clinical trials could be pursued in the future, and said each year one or two new treatments become available. What was your first treatment? On October 1 (within two weeks of the stage IV diagnosis), I started paclitaxel (Taxol), a chemotherapy that is given weekly on a 3-weeks-on, 1-week-off schedule. By December of 2015, my scans showed nearly a complete response to treatment; my liver tumor was even described as “resolved” in my chart. Were you aware of clinical trials at that point? I was aware that clinical trials existed, but didn’t know how to access them. I sought a second opinion at a research hospital in part because I thought I could enroll in a trial right away. However, the breast oncologist recommended getting the standard of care first, before joining a trial. This was for a few reasons. First, data on standard of care treatments have the most data, both on efficacy and side effects. Second, she explained that some trials require a lot of time (especially phase 1) and I lived a few hours’ drive from the hospital. Still, I knew that I would eventually want to get into a clinical trial. I delved into the research on triple-negative breast cancer and emerging treatments. I learned that it’s a heterogeneous cancer, with many subtypes. Most are unresponsive to hormonal or targeted therapies, which is why it is difficult to treat: there aren’t as many tools to treat this type of breast cancer. While it is true that you may have a positive response to chemotherapy initially, I learned that these responses usually aren’t durable, and with each successive treatment, the likelihood of a response decreases. Through ASK Cancer Commons, you received help from our Chief Scientist, Emma Shtivelman. When did you first reach out? I contacted Cancer Commons at the beginning of January 2016. Even though I’d had nearly a complete response to my first treatment, I knew it was unlikely to last. I read about Cancer Commons online, and how patients are able to submit questions about their treatment. This was exactly what I was looking for, because doing my own research raised many questions about my treatment. I couldn’t get all of my questions answered by my local oncologist. I would bring in articles and ask why I couldn’t have this or that off-label drug, and I think it was frustrating for both me and my doctor. Her knowledge was primarily on the accepted, approved treatments and I was asking about new research and treatments that weren’t yet the standard of care. So, I submitted my questions through an online form. First, I wanted to understand whether ablation of my liver tumor was recommended, and why or why not. Second, I wanted to know more about a copper depletion trial that showed promising results for triple-negative breast cancer. Finally, I wanted to know who the experts were on triple-negative breast cancer in my region. Cancer Commons responded almost immediately, confirming they received my questions. A day or two later, I received a personal reply from Emma Shtivelman. I was impressed by the expertise she conveyed in her responses to my questions, but was especially amazed by the caring and concern that came through. I felt more confident in my treatment plan, since she confirmed surgery was not recommended in my situation. I corresponded with Emma through the spring, as I dealt with elevated liver enzymes, scans that showed significant progression in my liver (only a month after my positive scans), and the search for clinical trials. Emma explained that elevated liver enzymes could exclude me from some trials, which I hadn’t realized. I worried that this was a sign of rapid disease progression, and again looked to Emma for guidance on my treatment plan. She reassured me that other patients had experienced elevated liver enzymes from Taxol, and that they would likely return to normal. She also helped identify trials I could qualify for despite my liver enzyme levels. During this very stressful time, it was a great relief to have a resource like Cancer Commons. I always felt that my questions were answered quickly and thoroughly, and when I didn’t understand something I knew I could ask for clarification. That type of quality interaction is very difficult to have in a 20-minute doctor’s visit! By February 2016, I had to decide whether to pursue a trial or move on to a second “standard” treatment, which for me was carboplatin. As I mentioned, I was very worried about rapid disease progression, based on the liver enzymes and the scans. Most trials require patients to be off treatment (called a “washout period”) for 3–4 weeks. This was a terrifying thought, especially since it was possible that if my liver enzymes worsened, I would not qualify for any trial. I took a few days to think about it. My local oncologist helped my husband and me think through the pros and cons of each option. It was a difficult and stressful decision, but ultimately, I was unwilling to risk being off treatment for a washout period, and started carboplatin instead. Carboplatin was a breeze at first. Treatment was just once every three weeks. My liver enzymes began to return to normal. My hair started to grow back. But as I was about to start the second cycle, a new problem arose. My platelets were very low, and none of the treatments helped much. My dose was reduced ,and I went on a weekly schedule. Unfortunately, in April, scans showed additional progression in my liver and new metastases in my hip and vertebrae. At that point, I knew it was time to commit to a trial. I had exhausted the two standard treatments. Other FDA-approved treatments weren’t that promising. Since my liver enzymes had returned to normal, I was less concerned about taking a break from treatment. How did you start narrowing down your clinical trial options? Some treatments (both standard of care and experimental) affect eligibility for future trials. Because I had Taxol, I couldn’t participate in most trials that used taxanes. The more treatments you’ve had, the fewer trial options. Many trials limit how many prior treatments a patient can have, regardless of the type of treatment. So that narrows options further. The more treatments you have had, the less likely you are to respond to a new treatment. Some trials exclude patients whose tumors aren’t “measurable” or that aren’t relatively easy to biopsy. Some trials exclude patients who have brain metastases. Based on these realities, I learned it is best to get into a trial as soon as possible (after exhausting standard treatments, that is). I took a multi-pronged approach to identifying trials. First, I did my own queries on breastcancertrials.org and clinicaltrials.gov. Over 100 trials met my criteria. I wasn’t able to prioritize based on the scientific evidence, but I did learn what new treatments were out there, locations of the trials, and what phases they were in. Second, I consulted again with the breast oncologist I’d met at the research hospital. She shared some trial options with me, but was reluctant to recommend phase 1 trials because of the time commitment. The phase 2 options she recommended were not a good fit. One was not specific to triple-negative breast cancer, and another was best suited for androgen receptor-positive tumors, which I did not have. Third, I consulted with my local oncologist. Cancer patients often are told to ask their doctors about clinical trials. My local oncologist supported me fully in pursuing a trial, but she wasn’t a specialist and did not have time or expertise in triple-negative, stage IV trials. As I mentioned, she was a helpful sounding board for the various options I was considering, worked with the breast cancer specialist, and provided feedback and input on alternatives I was considering. Finally, Cancer Commons was extremely helpful in identifying and narrowing down the best trial options. Emma provided a list of about 10 promising trials for metastatic triple-negative breast cancer in my region. For each trial, she explained why she thought it was a good option. She considered details about my genetic testing and other tumor test results (e.g., PD-L1, androgen receptor, BRCA mutation, etc.). Most trials she recommended were testing immunotherapy drugs, such as nivolumab, ipilimumab, and pembrolizumab in combinations with each other or with other agents. She also identified a trial that was testing an antibody-drug conjugate called IMMU-132, which delivers chemotherapy in a more intensive and targeted way. Even if the trial database says the trial is recruiting, they may not be recruiting for your particular type of cancer. It isn’t always clear whom you should contact about a trial. In some cases, I reached out to the sponsor, and in others I contacted the PI (principal investigator). It’s sometimes difficult to get the correct contact information for a trial. I left many phone messages and got some wrong numbers. In one case I called six or seven different numbers! It can be very frustrating, but it’s important to be persistent and find the right person who can point you in the right direction. All trial sites I contacted required a meeting with the trial team. Only then would I learn what trials were available. I wasn’t able to find this out on the phone. Three of the four sites I visited presented different trials than the ones I was initially interested in. This surprised me. I assumed (incorrectly) that it would be a clear, straightforward process: I tell the team which trial I’m interested in and they tell me whether I can participate. Instead, the trial team evaluated me as a potential trial participant and then presented me with trials they felt were the best match. The trials weren’t presented as options for various reasons. One trial was already full. Another trial was still enrolling phase 1, which needed to be completed before phase 2 enrollment could begin. This showed me that trial slots can be very dynamic. It can be confusing to be presented with a trial option that you haven’t considered before. One trial presented two entirely new drugs that didn’t even have names yet! In these situations, it’s important to take your time; read over the protocol, consult with someone outside the trial team (like Emma at Cancer Commons!) who can help you objectively evaluate the trial. Think carefully about whether it’s what you want, and determine whether it may exclude you from a future trial that may be more promising. If a site doesn’t have an open slot in a clinical trial, there may be openings for the same trial at another nearby institution. Ask the trial team if they can find out for you. If not, contact the other sites. I could not make appointments at any of the sites until I got approval from my insurance plan to cover the visits. This was a big challenge, since none of the trials were in my insurance plan’s network. Fortunately, my local hospital helped me get some approvals. My insurance plan did not want to approve visits for different trial sites. Once I had qualified for a trial, they denied coverage for visits to other trial sites, even though I was still gathering information to make my decision, based on what was the best, most promising, least risky option. While this meant I might have to pay for some visits out of pocket, I found out how much it would cost and decided to schedule appointments regardless of whether my insurance would cover the visits. I knew that my insurance might still cover some of the costs associated with treatment, even if they hadn’t paid for the initial consultation for the trial. How did you make your final choice? Many factors influenced my final decision. This is where strategic thinking came into play. Emma strongly recommended combination immunotherapy trials that were recruiting in my region. However, one site was recruiting for a single agent trial and wouldn’t start recruiting for the combination immunotherapy study for another month. I didn’t want to wait that long to enter a trial (by that point I’d already been off treatment for a month). Emma also explained that the response rate for single agent trials among triple-negative breast cancer patients was around 20%, whereas combination trials for other types of cancer were showing much higher responses. Emma helped me realize that the single agent trial wasn’t my best option. I clearly communicated this to the trial team; they were impressed when I explained what trial I wanted and why! Because the combined immunotherapy trial wasn’t an option, I began to consider an antibody-drug conjugate trial (IMMU-132) which had an immediate opening. This trial had already started phase 2, and the response rates were higher than for the single agent immunotherapy trials. Furthermore, most patients experience few serious side effects and some of the responses to the drug so far have been longer-lasting. I am still hoping to get into an immunotherapy trial in the future. If I had selected the earlier stage single-agent immunotherapy trial that was offered, I would be disqualified from a combination immunotherapy trial that could be more promising. My current trial still leaves immunotherapy open as a future trial option. Hopefully, if I am able to enroll in an immunotherapy trial, we’ll have more data about efficacy and side effects, which means I’ll have to take on less risk. Overall, I think I made a well-informed decision backed by strong data. I couldn’t have done this without the guidance and expertise provided by Cancer Commons. While none of this guarantees a good outcome, I feel very good about the trial, and have a lot of confidence that this was the best option for me. How did you enroll in the IMMU-132 trial? When I first called the trial sponsor, I was told they weren’t recruiting for triple-negative breast cancer. This was a challenge I faced with several of the trials I considered; when you look up a trial on clinicaltrials.gov, and the listing says the trial is recruiting patients, it may not be recruiting patients with your particular type of cancer. I called many trial sites trying to track down the person in charge of recruitment. Some said they weren’t currently recruiting for triple-negative breast cancer or that the trial hadn’t officially opened yet. Fortunately, my local cancer center is affiliated with one of the sites for the IMMU-132 trial. My local oncologist reached out to the PI, who said they had an opening for me in the phase 2 study. My husband and I drive 2 hours each way to Boston for treatments. Each treatment cycle is 3 weeks long; infusions are on weeks 1 and 2, and week 3 is a break. The side effects were a little rough at first, but have lessened after I learned to proactively manage nausea with medication. I have had low WBC (white blood cell) counts (an expected side effect), but this is managed proactively with medication as well. My liver enzymes and platelets are currently normal, and a recent scan showed positive results, so I’ll stay on the trial as long as that continues to be the case. I have encountered some challenges in coordinating care between my local cancer center and Massachusetts General Hospital (MGH) in Boston. We’ve had to figure out a protocol to get routine blood work done locally the day before my treatment, so I don’t have to drive to Boston if I can’t get treated that day. People at both institutions were unclear about how to order medications that are needed to manage side effects when I am at home (it turns out both need to be involved). It was also somewhat unclear how to convey test results back and forth since the hospitals use different information systems. The nurse navigator at our local cancer center has been a helpful resource for resolving these challenges. Looking ahead, what do you think your next steps will be? If disease continues to regress or remains stable, I will continue the treatment. If the scans show progression, I’m keeping in mind some of the immunotherapy trials I looked at earlier, which may soon be actively recruiting. I have enrolled in a new health insurance plan that includes all Boston research hospitals in its network, which should make the approval process much smoother. The trial scene is constantly changing, so I get alerts whenever something new fits my criteria on breastcancertrials.org. I will definitely consult again with Cancer Commons about my options, and hope that Emma will continue as my advisor! What advice would you give to someone who is wondering whether a clinical trial might be a good option for them? I would recommend asking Cancer Commons some questions; this can save you a lot of time. I have referred many people to Cancer Commons to get input on their treatment plan and to help them feel more comfortable. I think it’s a great first step to help you understand your disease, clarify decisions you have to make, and access the latest treatment information your community-based oncologist may not have. Second, I would look carefully at your calendar and figure out what types of commitments you are willing to make for a trial. My trial involves treatments, scans, and optional biopsies; all of these must occur at the trial site. If it’s summer and you have a family vacation planned, you might decide to postpone your trial entry so it doesn’t interfere (if you have that luxury). Once you are in a trial, your treatment protocol schedule comes first; everything else has to work around that. It might not be for everyone. Third, I recommend using the internet to identify individuals who have the same type of cancer you have. Talk with them about trials they have participated in, or have heard of. I found valuable information about other patients’ trial experiences through Twitter, Inspire.com, Facebook, and the Triple Negative Breast Cancer Foundation. Also, MET UP and Metavivor are two important organizations that educate, advocate and support the need for increased funding for metastatic breast cancer research and treatment. I recommend attending any meetings or conferences where you might meet other patients. I attended both the Metastatic Breast Cancer Forum at Dana Farber in October 2015 and the Living Beyond Breast Cancer’s Metastatic Breast Cancer Conference in April 2016. Both were extremely valuable and showed me that a great community of patients exists. Finally, I would mobilize your support system in advance to help you with the logistics of being in a trial, especially if you have to travel. Ask friends and family to help with transportation, childcare, pet sitting, and meals before you embark on a trial. Warn them that your treatment schedule can change based on blood work so requests for help may be last minute. In summary, finding and getting into a clinical trial was a challenging process, but I feel it was well worth it. Cancer Commons provides an invaluable service helping patients navigate the process and providing access to expertise that is hard to find elsewhere. I wish I had known about it even sooner, but feel fortunate to have found such a valuable and important resource! Super Patients are cancer survivors who learned to be more engaged in their own care. Cancer Commons believes every patient can be a Super Patient or benefit from a Super Caregiver. We hope these stories will provide inspiration and hope for your or your loved one’s own treatment journey.